123. Intended as a substitute for the crank. Reciprocating rectilinear motion of the double rack gives a continuous rotary motion to the center gear. The teeth on the rack act upon those of the two semi-circular toothed sectors, and the spur-gears attached to the sectors operate upon the center gear. 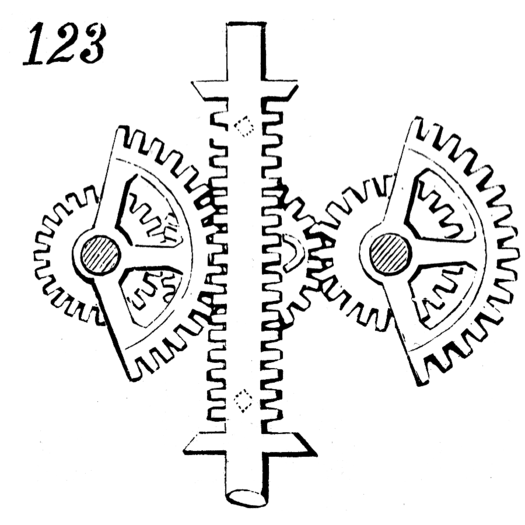 The two stops on the rack shown by dotted lines are caught by the curved piece on the center gear, and lead the toothed sectors alternately into gear with the double rack.